Two members of the Half Flight seated in a Maurice Farman Shorthorn aircraft, Mesopotamia, 1916. The Australian Flying Corps dispatches 41 men, four officers and transport to support Anglo-Indian forces in the Persian Gulf. Known as the Mesopotamian Half Flight, the contingent arrived too late for operations in the Gulf, but joined the British advance on Baghdad. 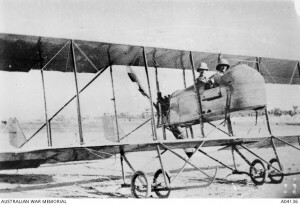 This constitutes the first use of Australian aircraft and aircrew in a war situation. 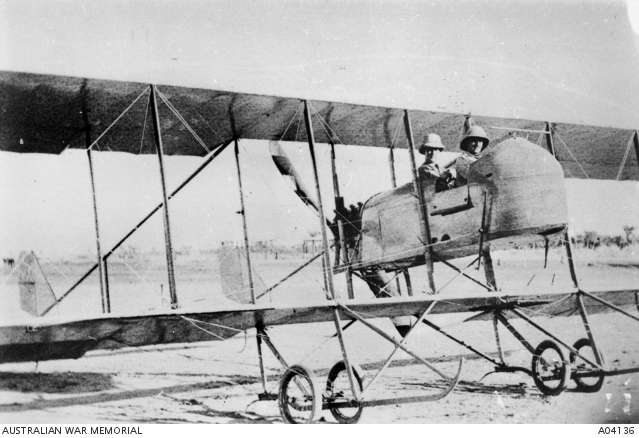 Australia was the only British dominion to set up a flying corps for service during WWI. 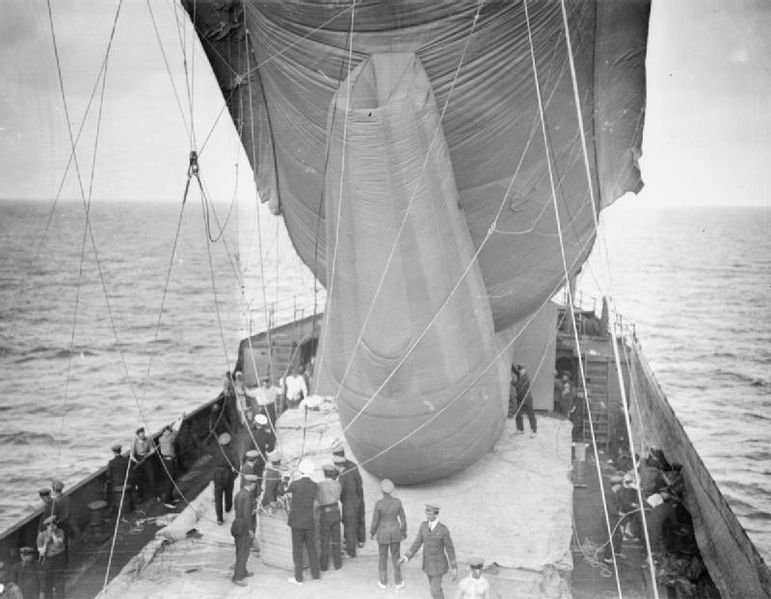 A ‘Drachen’ type balloon is held steady aboard the SS Manica, as a spotter prepares to climb into the basket, Gallipoli 1915. 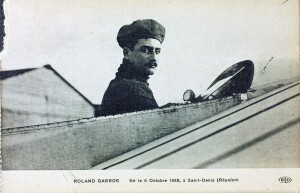 Image courtesy Imperial War Museum. Two spotters in a balloon attached to the Royal Navy ship Manica in the Dardanelles sight a Turkish encampment, fix its position on their map, and telephone the information to the Manica. The ship relays the information to the armoured cruiser Bacchante, which is hidden over the horizon. The Bacchante proceeds to release shells on the encampment, much to the amazement of the unsuspecting Turks. This is the first operational use of a balloon ship during World War I. The Ottoman Empire begins to lay siege to the important Armenian cultural, social, and economic city of Van. The Armenians revolt; fighting continues until 17 May. George Edgar Lockie enlists. George is commemorated on the Centenary of WWI in Orange Honour Roll; he would be killed in action in Belgium on 7 June 1917. Royal Flying Corps pilot Lanoe Hawker attacks the German Zeppelin sheds at Gontrode in Belgium, destroying a brand-new shed and shooting down a nearby observation balloon. Hawker is awarded the Distinguished Service Order for the action. 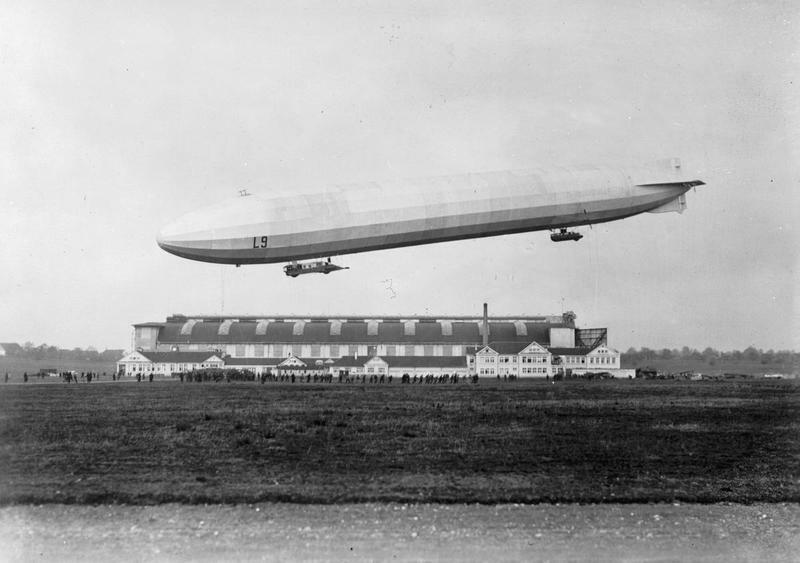 The Germans soon cease to use Gontrode as an airship base. George Edgar Lockie was born in Selkirk in Scotland in the late 1880s. His parents were George and Helen Lockie; he had a sister, Nellie, and a brother, Walter. George was educated at Knowepark School at Selkirk. George came to Australia aged 24. He and his brother Walter settled in Orange, where they had relatives. When Walter married in 1913 George was his best man. George enlisted in April 1915 and was allocated to the 3rd Battalion, 6th Reinforcements as a private. He disembarked at Gallipoli in July, where he served for just over two months before being hospitalised with influenza. George returned to duty briefly, but was found to be unfit for duty and was transferred to Sarpi Rest Camp on the island of Lemnos. 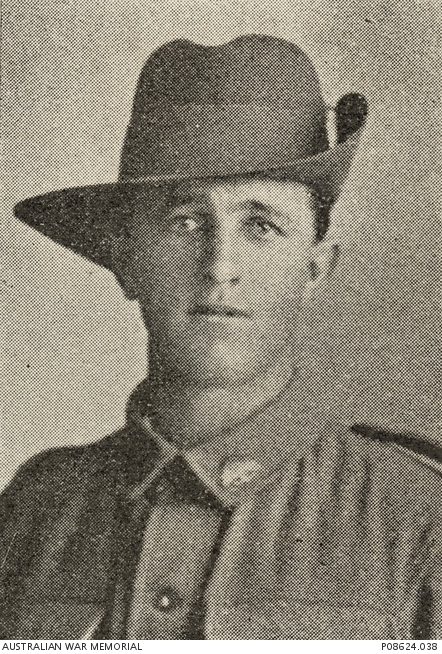 Private Lockie joined the 45th Battalion in May 1916, and proceeded to Marseilles with the British Expeditionary Force the following month. On 26 Boxing Day 1916 George was appointed Lance Corporal. George was killed in action in Messines in Belgium on 7 June 1917, aged 29. He has no known grave and is commemorated the Ypres (Menin Gate) Memorial, Panel 27, in Belgium and on the World War I Roll of Honour on the southern face of the Orange Cenotaph. Walter and his family remained in Orange for many years, firstly at 27 Sampson Street, and later at 33 Lord Street. Walter relocated to Ashfield prior to his death in 1965. 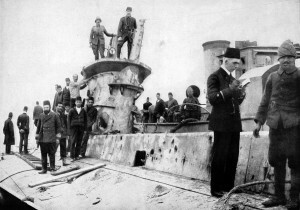 Turkish and German personnel inspect the wreck of the E-15. Image courtesy The War Illustrated, 17 July 1915. The British submarine E-15, commanded by Theodore Brodie, attempts to move through the Dardanelles into the Sea of Marmara, while seaplanes are deployed to distract the Turks. E-15 is grounded by a strong current, the Turks begin to shell the foundering submarine and Brodie and several of his crew are killed. The British Army launches the Battle of Hill 60 with the detonation of several mines laid beneath German positions on Hill 60, south-east of Ypres on the Western Front. The explosion literally blows the enemy from their defences, and is the first such attack of its kind. Heavy fighting continues until 22 April, resulting in the British capture of the Hill. Bernard Patrick Dawson enlists. Bernard is commemorated on the Centenary of WWI in Orange Honour Roll; he would be killed in action at Gallipoli on 6 August 1915. Having regard to the example which has been set us by His Majesty the King, the Army, and the whole nation generally, restricting the consumption of alcoholic drinks during the period of the War, every man in the Battalion is expected to use the utmost restraint to guard against over-indulgence. And the fairest end to make? And to die for Freedom’s sake! And your name on Honor’s Roll! Youngest of the angels, bravest of the dead! Go, before our armies, burn above our strife. Stars in England’s Heaven, heirs of endless life! Mother, why do you weep so long? O father, why do you sigh? As the hero souls go by! The hero lives in the hearts of men. And his soul is glad with God! Bernard Patrick Dawson was born in Orange in 1887 to James Dawson and his wife Mary (nee McConville). A sister, Catherine, was born two years later. It is not known how long the family remained in Orange; by the time Bernard enlisted in April 1915 both his parents had passed away and he was working as a postman in Drummoyne. Private Dawson’s war career was very brief; lasting just under four months. He embarked from Sydney in June 1915 and joined the 2nd Battalion at Gallipoli on 6 August. The following day he was reported missing in action. 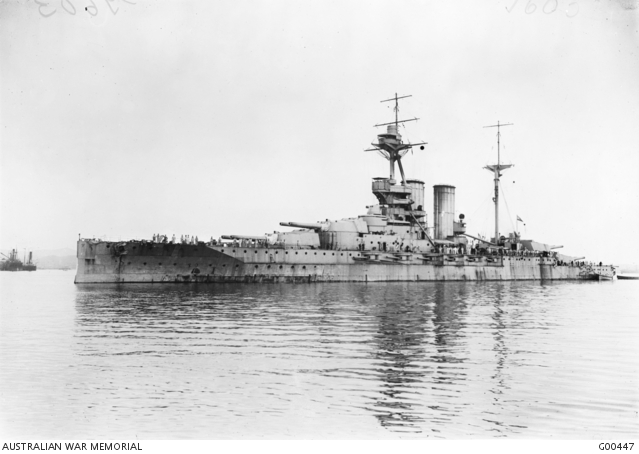 This was upgraded to killed in action following board proceedings that took place on 24 August 1915. Bernard is commemorated in the Drummoyne War Service Record and the Baptistry Memorial at St Mark’s Catholic Church at Drummoyne. The German Navy Zeppelins L-5, L-6, and L-7 raid the east coast of England, inflicting little damage. 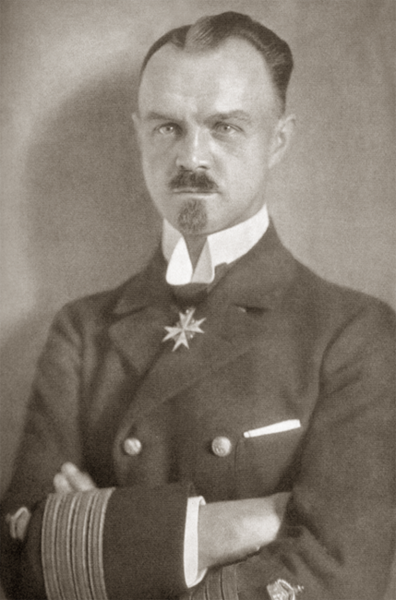 L -7 is carrying an observer: Peter Stresser, the Chief Commander of the German Imperial Naval Airship Division. The Leader publishes a poem from the Egyptian Times, sent by Trooper McLean of Bloomfield. The poem describes the persistence of the locals while peddling their wares. 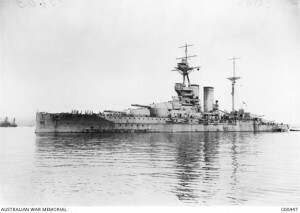 The battleship HMS Queen Elizabeth in Mudros harbour off the Gallipoli Peninsula 1915.